It shouldn’t come as too much of a surprise when I say that travel photography involves a lot of travel. An assignment earlier this year had me on the road for 4 weeks. One of the challenges this creates is how to manage all your images while on the road. In the old days for a month of shooting I would pack around 150 rolls of film in a bag, and just shoot. Once exposed, the rolls went in another bag. I flew home and sent the film to the lab. Job done. But with digital things are different. Sure, I no longer have to worry about storing film in hot places but now I have to think about hard drive space, backups and power. Shooting digital on a 4 week assignment I might end up with 10,000 frames, which on a Canon 1DsII is about 150GB of images. I can pretty much guarantee that’s more than will fit on a typical laptop. So what to do? 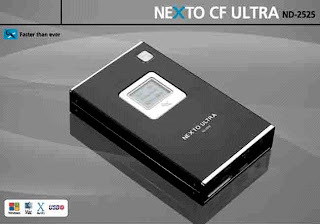 My solution is a pair of NEXTO CF ULTRA portable hard drives. These are battery powered 2.5” hard drives in a compact enclosure, powered by an internal Lithium-Ion battery, with Firewire 400 and USB 2 connectivity and a CF card slot in the top. There are a whole bunch of similar devices on the market, from the Epson P5000 to the JigaView Pro. So why do I like the NEXTO? Firstly, it copies images extremely quickly, downloading a 2GB card in just over a minute. This is more than twice as fast as many rivals. And secondly it doesn’t have a big colour screen. This means the battery is very long lasting, and since I usually travel with a laptop the big screen would be superfluous anyway. And what about those other things I mentioned; backups, hard drive space and power? I carry 2 NEXTOs, and at the end of each day copy all my CF cards to both drives. That way I have 2 copies of every image, in case one hard drive fails. While I’m traveling I can also keep the two drives in separate bags, so the chances of losing or breaking both are pretty slim. I usually run the ‘quick checksum’ that verifies the first 4k of each file on the disk matches that on the card. There is a full checksum but it takes quite a long time, so I’m hapy to use the quick version. Each NEXTO contains a 160GB drive. So even on a long shoot I’ve got enough space for all my images. The 160GB drive on my MacBook Pro typically only has about 30GB of free space, so relying on a laptop alone is really not practical. Additionally it doesn’t give you a second drive for a backup. The NEXTO is powered by an internal battery. Because it has very fast copy speeds and only a small LCD status screen, Once charged up the battery is good for about 30GB of downloads before you need to recharge. If you need more you can get a small external battery that lets you go for 80GB of downloads without charging. This came in handy when I went to Everest Base Camp and was away from power for 16 days. If I’m traveling light, such as the Everest Base Camp trip or when hiking Tasmania’s Overland Track last year, then I just travel with the two NEXTOs. Between them they weigh about 0.75kg and take up a lot less space than 150 rolls of film. If I’m able to carry a laptop then I can edit each day’s take while I’m on the road. I plug in one of the NEXTOs into my MacBook using the Firewire 400 socket and import the previews into Lightroom, leaving the original RAW files on the NEXTO. I can then select and rank and adjust the images without having to squeeze them onto my cramped laptop drive. Once I get back home I then back up all the images onto my main storage drives and most of my editing work is already done. NB – I’m in no way affiliated with NEXTO – just a happy customer. Good stuff, I may get myself one of these. How much are they? The 160GB version is currently selling on Amazon for £175. Do a search for 'Nexto' and they'll show up. Is travel stock photography dead?